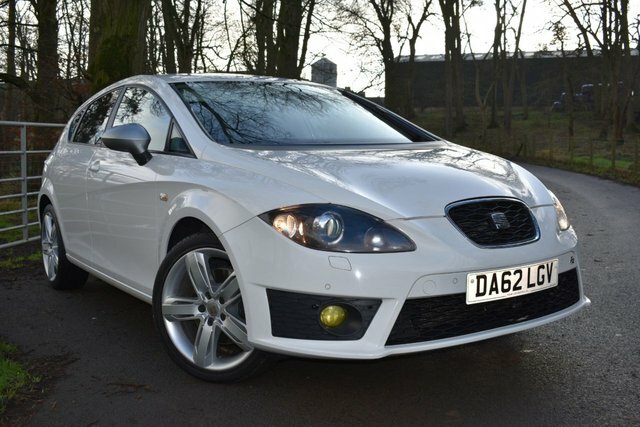 Sammy Lees Motors are delighted to welcome into stock this 2012 62 Plate Seat Leon 2.0L CR TDI FR Plus with 168 BHP. Finished in the sought after White which is perfectly complimented by a classic Black cloth upholstery with eye catching red stitch & 18 5 spoke alloy wheels. The Seat Leon's appeal lies in its combination of value, space and sportiness as well as providing excellent fuel economy with Seat claiming this vehicle will return 55.4 miles per gallon on average. This vehicle benefits from a full detailed service history having been serviced at 13,697 miles on 29.11.14, 19,751 miles on 5.11.15, 25,680 miles on 26.11.16, 37,133 miles on 3.3.18 & will receive a full detailed service & 12 months MOT prior to customer collection as well as 1 years full FREE in house warranty - offering complete peace of mind. This immaculate & high specification vehicle comes with : - * Sat Nav, * Cruise Control, * Bluetooth Connectivity, * Front & Rear Colour Coded Parking Sensors, * Dual Zone Climate Control, * Colour Touch Screen Audio Visual Display, * Automatic Headlights, * Bi Xenon Headlights, * ISOFIX, * Front & Rear Electric Windows, * 2 Remote Control Key Fobs, * Skoda Handbook Pack + Much More! Available in a range of body styles, including as a three and five-door hatch and an estate model, the SEAT Leon combines sleek styling, an agile and responsive driving experience and day-to-day practicality. If you're ready to test drive one of the used SEAT Leon models for sale in Appleby In Westmorland then be sure to contact a member of the team at Sammy Lees Motors Ltd today. We'll do everything possible to get you a great deal on your next used car and ensure you find the right model to fit your lifestyle and budget. Feel free to contact one of our showroom team to discuss your options in more detail.